Name is from local residents. 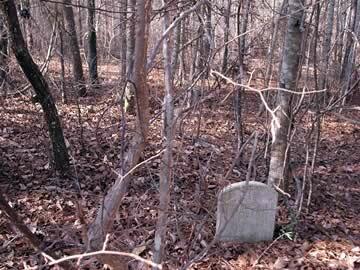 No graves marked Lattimore found. From the Baldwin County Courthouse, go east on Hancock St. and follow Highways 22/24 southeast for 1.2 miles to Kings Road. Turn right on King's Road and go 2.5 miles to Stembridge Rd. Turn right (south) on Stembridge Rd. and go approximately 3.3 miles to Butler Rd (dirt) on the right. Turn right on Butler and drive 0.6 mile to the old Bess Smith farmhouse on the right (you must go past a gate approximately 0.1 mile before reaching the house). Walk through the woods directly behind the house and go 0.1 mile (approx 200 yards) directly behind the house. You will encounter a sandy woods road. Once you get to the road, you may need to go slightly to the right to where the road swings around to the left (and away from the house). The cemetery is on the left side of the woods road, 200 feet after it curves to the left (in the direction away from the house). The cemetery is about 20 feet off the left side of the road. A guide or GPS receiver is recommended. All info per death certificate in possession of Johnette Brooks.